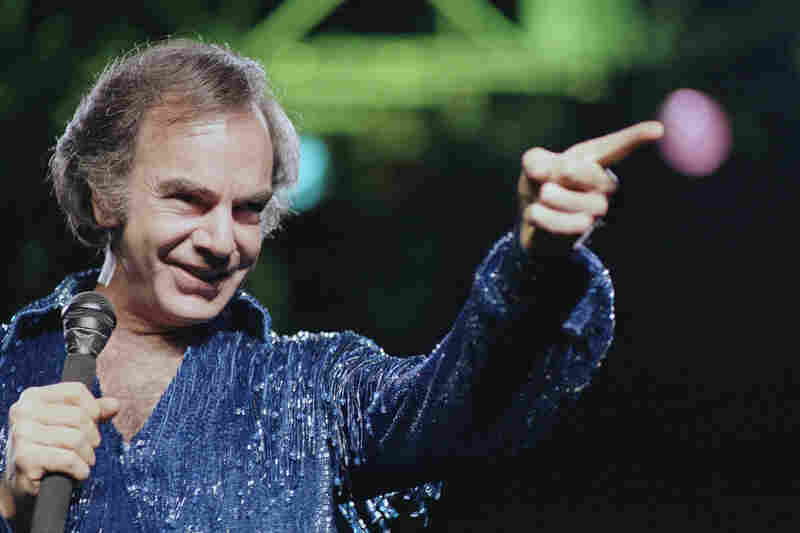 When Neil Diamond Finally Put Himself Into His Music In 1966, a Tin Pan Alley songwriter finally found the spotlight with a tune he calls a "me" song, and launched a career as one of the country's most popular concert performers. But before "Solitary Man," Neil Diamond was hesitant to even embrace his own name. Neil Diamond was born in Brooklyn, N.Y., in 1941. He was a performer from an early age, singing alongside Barbra Streisand in the All City choir as a New York City high school student. 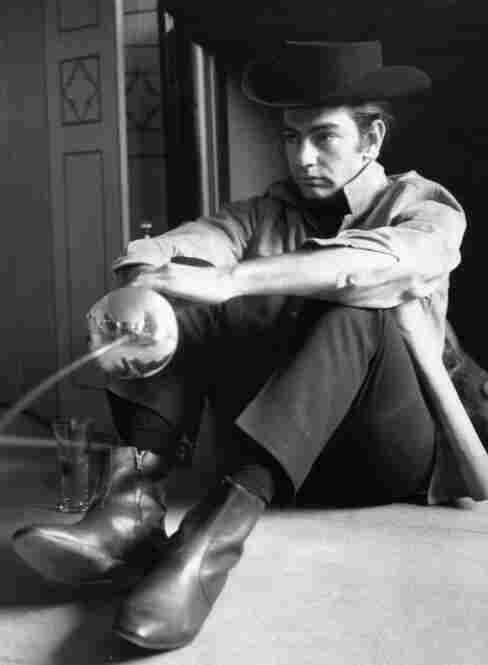 Off stage, Diamond (shown here posing with his sword in May 1967) was an avid fencer and attended New York University on a fencing scholarship. Diamond was dropped by Columbia Records in the early 1960s after multiple unsuccessful recordings. He turned his attention to songwriting and had his first hit in 1965 with Jay and the Americans' "Sunday and Me." Diamond went on to write "I'm a Believer," "Sweet Caroline" and other songs for artists like the Monkees and Elvis Presley. His own recordings followed in 1966 with "Solitary Man." 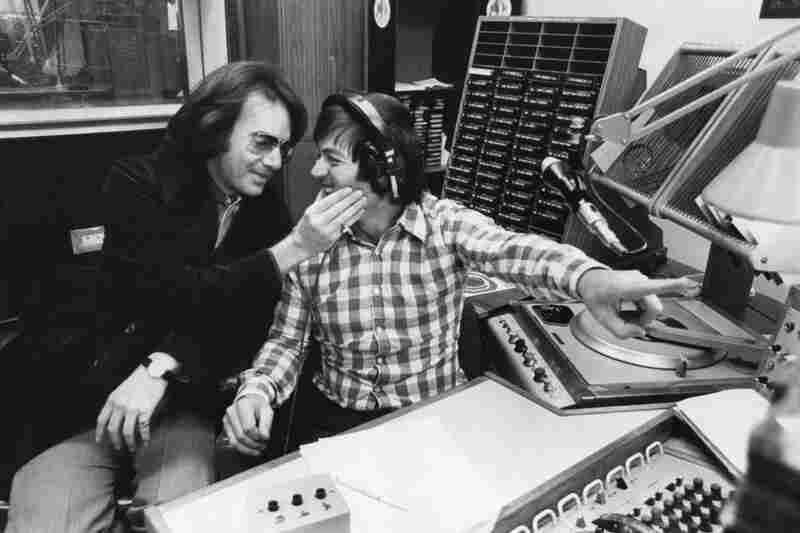 Here, Diamond talks with BBC Radio 1 disc jockey Tony Blackburn in 1974. Diamond continued to churn out present-day classics like "Holly Holy" and "Song Sung Blue," which reached No.1 on the Hot 100. After performing in sold-out venues, Diamond released Hot August Night in 1972, an album critics hail as "the ultimate Neil Diamond record." Here, Diamond performs at New York's Madison Square Garden in 1986. Despite the drop in record sales during the 1980s and '90s, Diamond's ability to sway the hearts of women all over the world kept him thriving on the tour circuit as he continued to perform to sold-out crowds. Billboard ranked him as the most profitable solo performer of 1986. The '80s also saw Diamond's start on the silver screen as he appeared in the 1980 film The Jazz Singer. He and Faith Hill performed at the 2009 MusiCares Person of the Year Tribute to Neil Diamond in 2009. 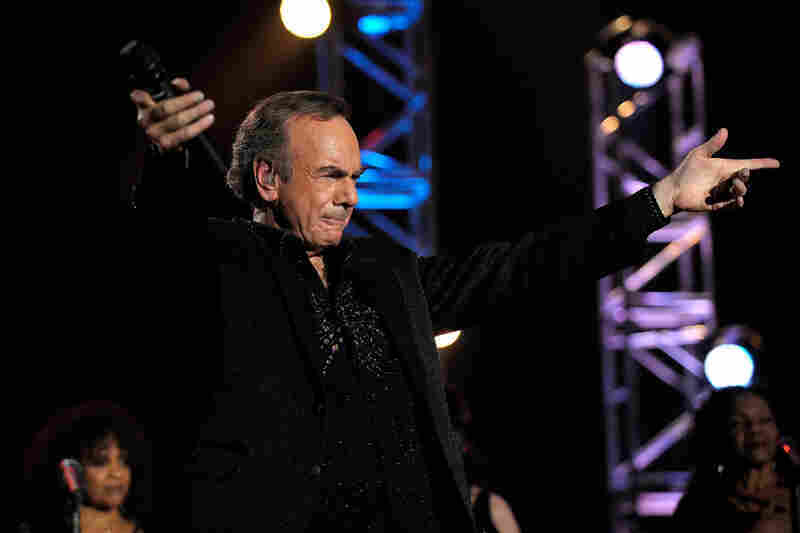 Continuing to tour, record albums and appear on television, Neil Diamond remains a staple of contemporary pop music. Monday night, five new performers will be inducted into the Rock and Roll Hall of Fame. Over the past several weeks, Morning Edition has looked behind the stage personas of this year's honorees. Here, we conclude the series with the story of an anonymous Tin Pan Alley tunesmith who went on to become one of the country's most popular concert performers. A brooding young man sat in the offices of a prominent New York music publishing company one day in the early 1960s. Sitting next to him was one of Aldon Music's staff songwriters, Cynthia Weil. She recalls that this guy wasn't sure about who he was. He wasn't even sure about his own name. "I said, why would you change a name like Neil Diamond?" Weil says. "That's beautiful. He said, 'Diamond! Diamond! You think that's beautiful?' I said, 'Yeah, it's ... Diamond!' And he said, 'Oh, I don't know.' "
Neil Diamond did know that he wasn't interested in his pre-med studies; he spent most of his class time jotting down song ideas. Diamond tried recording demos of his tunes, but they always ended up sounding like half-baked versions of The Everly Brothers or Buddy Holly. In a 2005 interview with WHYY's Fresh Air, Diamond said he wasn't any good at emulating someone else's voice and experience in a song. "That's probably why I spent eight years down there in Tin Pan Alley and had very little success," he said. "There was not a lot of me in those songs." Success finally came in 1966, when Diamond got the chance to give voice to his own words and music.
" 'Solitary Man' was the first in a long line of 'me' songs, my experience songs," he said. But to express the "me" in a song, one has to keep coming up with new things to say. In 2008, Diamond wrote that he feels a sense of dread when it comes time to make a new album — a sense of doubt as to whether he's going to be able to write a decent set of songs. Weil says every songwriter fears that. But she says she is lucky not to be the one singing her words. "The great thing is, if you don't write a hit, nobody cares and nobody knows," she says. "You're not like the artist that's going down in flames. It's basically our job to stay in the background. Sometimes, you feel you want to say, 'That's my song,' but it's not the way it is." Neil Sedaka started his career in the background, writing songs for others, but he says he only really found himself when he started performing his own material. He says audiences know the difference. "People can sense when the song comes from their gut, when the lyrics and melody come from their gut," Sedaka says. Sedaka and Diamond are old friends. They grew up in the same Brooklyn neighborhood and have both made careers out of singing their own songs. But, he says, the price for being yourself is that you always have to top yourself. "You know, that blank page is always scary," Sedaka says. "But, certainly, if you have a history of as many hits as [Diamond has], you do have to do something that raises the bar." Over the course of nearly a half-century, Diamond has placed more than 70 songs on the pop charts. And, though he may not always know where that next song is going to come from, he has come a long way from the days when he wasn't even sure who he wanted to be.